The Zeus Thunder 2 is a pen-style wax and oil compatible vaporizer from Zeus Arsenal. It’s designed to be as discreet and portable as possible, giving you the ability to vape your favorite waxy concentrates wherever you happen to be. Let’s open the box and find out whether the Zeus is a worthy competitor in the rapidly growing wax vaporizer market. As soon as you open the box, you can tell that the Zeus is a high-quality, well-designed vaporizer. The presentation in the package is very impressive. Right when you open the box, you’ll be presented with the Zeus itself, right next to the so-called “Z-App”, a shiny metal tool that you use to load your waxes onto the heating coil in the wax cartridge. The Thunder 2 itself, measuring in at about 5 inches long, is comparable in size to most other vape pens and is a great size for carrying around all day in your pocket. It’s extremely lightweight and is built from a smooth, well-crafted, sturdy material that makes this thing feel super luxurious and unbreakable. The Thunder 2 provides a really solid and enjoyable vaping experience. The vapor is flavorful, dense, and you’re able to get whatever size pull you want with ease by holding on the button while inhaling. Everything feels like it’s in your control. Do you need to take a small stealth hit out in public? Not a problem. Want to blow massive, glorious clouds at home or with friends? The Zeus Thunder 2 is more than capable of making that happen. The only (slight) downside I noticed was that the wax atomizer gave a very slight metallic taste when it was brand new, but after breaking it in the taste went away. Honestly I hesitate to even mention it, it’s such a minor, insignificant taste but in the interest of full disclosure I figured I’d let you know. Loading the wax is super-easy. Everything on the Thunder comes apart by pulling on or unscrewing the o-rings, making disassembly and cleaning a breeze. The included loading tool (Z-App) is incredibly useful and makings placing just the right amount of wax right smack in the middle of the atomizer as easy as humanly possible. If you’ve ever operated a vape pen before, you’ll be able to use the Thunder. Just press the button five times to turn it on/off, and once you load the wax just hold in the button for a couple seconds and inhale. It literally doesn’t get any easier to vape your favorite waxy concentrates. 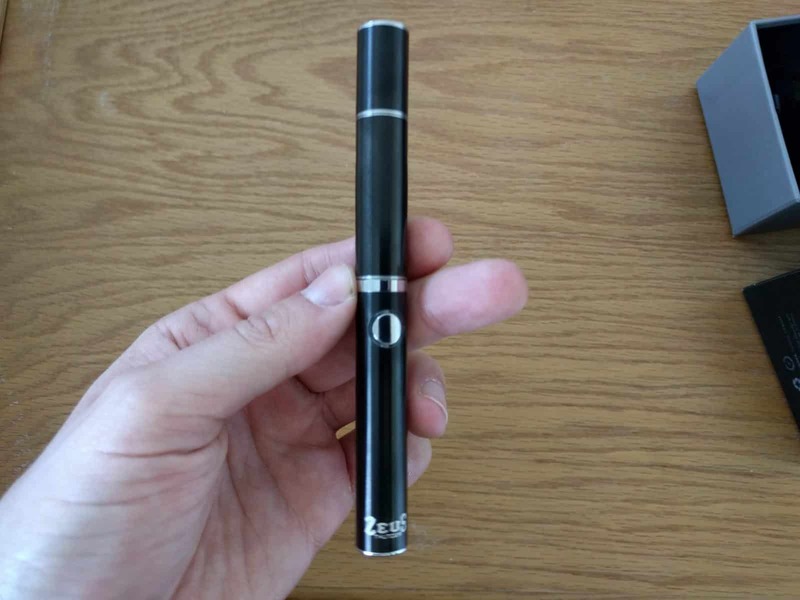 The Zeus Thunder 2 is an affordable, high-quality wax vape pen. It doesn’t have all the bells and whistles that you would expect from a more expensive unit, but it’s very competitive with other vapes that sell at a similar price point. You’ll get great clouds, good flavor, and solid construction in a standard-sized vape pen that is great for carrying around all day. I’d definitely recommend the Zeus Thunder 2. The best place to buy the Zeus Thunder 2 is from Toronto Vaporizer. I can attest to the fact that their customer service is top-notch, their prices are great, and they’re shipping is extremely fast. Also be sure to check out the rest of their wax pens, everything they keep in stock is just as good as the Thunder 2.